Controlling a card to the top or to the bottom is the most fundamental technique in card magic. Every card magician should have at least one good method to do that. Consequently many authors use the phrase "control card to the top/bottom with your preferred method" and leave the rest to the reader assuming that everyone already has his or her preferred method. While you might have your favorite method, the search for better ones never stops. 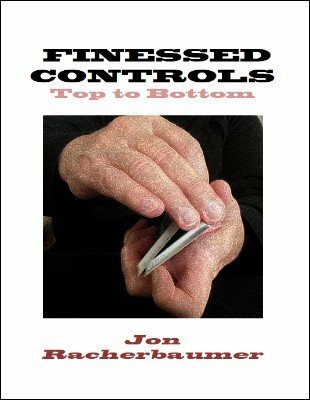 In this ebook Jon Racherbaumer describers several - as he calls them 'finessed' methods - to control a card to the top or to the bottom. You should find at least one or two that fit your style and needs. 1st edition 2012, 71 pages, photo illustrated.